June 20, 2017, © Leeham Co.: Boeing closed out the second day of the Paris Air Show capturing the orders headlines again with a big one: 100 for the 737 MAX 10 from United Airlines. While the number and the blue-chip customer are welcome for the launch of the program, it came at the expense of converting all of them from other MAXes previously ordered by UAL. Boeing also announced MAX 10 orders from Chinese lessor CALC (15), Chinese airline OKAY (8) and US lessor Aviation Capital Group (20). These are new orders. John Leahy, COO Customers of Airbus, was quick to dismiss the public relations momentum the United deal gave the MAX 10. Speaking at an Airbus event in which Ethiopian Airlines announced a repeat order for 10 A350-900s, Leahy dissed the UAL deal and MOUs and orders announced Monday, in which 66 of the 168 deals announced were conversions. There now have been 166 of 309 orders and MOUs that are conversions from the MAX 8/9. Boeing said there will likely be more MAX 10 deals announced tomorrow and possibly Thursday. Leahy, at the Ethiopian event, said that Boeing “paying money” and converting orders wasn’t much of a program launch. Ironically, only a few hours after the Airbus event, Ethiopian and Boeing announced a 777F/MAX 8 set of orders. But up-gauging orders is not at all uncommon at Boeing or Airbus. Whether Boeing “paid money” to persuade customers to switch from the MAX 8/9 may be hyperbole, but it hardly matters. Kick-starting the MAX 10 program is what counts, and with 309 orders and MOUs announced so far, Boeing already blew through the 240 figure company officials touted just yesterday and the top-end 300 orders some analysts thought would be the sales figure for the MAX 10. It also compares favorably with the 500+ orders over the life of the 737-900/ER program and the estimated 410 orders for the MAX 9, prior to conversions. The only time the A321neo beats the MAX in range, Delaney said, was when it is equipped with three auxiliary fuel tanks. So far, Airbus announced 122 new A321neo orders, still short of the new ones for the MAX 10. But there are two days left and Leahy is famous for having one last, big deal on the last day to win the orders race. For the first time in recent memory, Boeing will have an end-of-show press conference Thursday. This begins an hour after Leahy ends his end-of-show press conference. There will still be time for the two companies to try for one final one-upmanship. Why doesn’t Boeing offer extra fuel tanks on the MAX10 to meet or beat the range of the A321neo? Because the weight capability is not there. Belly space is not the issue. You wanna carry fuel or payload? With 200 pax, the -10 will be able to carry maybe 39,000lbs of fuel, well within full tanks. And with that it will fly about 2500nm, give or take, with about an hours worth of reserves. Reduce the payload by 50 pax and then you might have weight to put some fuel in an ACT. But then you would be better off on a -8. The MAX can carry one extra tank while the neo of course can pack in three. My personal view is that the bulk of single aisle routes are less than 2500Nm, why bother losing hull space, could however also be MTOW limits. The MAX8 is capable of serving routes beyond 3000Nm. Bottom line, horses for course and the MAX10 has its place. Then they should have done this long ago! No it is a fair point. First Boeing dithered after airbus launched the NEO. Then it waited forever to address the lack of competitiveness with the A321NEO. Management was short sighted and focused on the stock price and did not want to spend a nickle more than was necessary on the MAX. Think Boeing was not sure if they want to go with an NSA or MoM first. Decision to go for the MAX10 may indicate that they will go with the MoM first? In the mean time the 737MAX’es will have to do the job for them in the SA market. Somewhere a decision on the MoM fits into this, think it has already been made? sowerbob: Well I know I am a hard head, but I would think that Boeing would have made an ID on the segment a long time ago and executed. has me scratching my head, not for the first time though! And yes I think the MOM is a done deal, what is open right now is what combo the power plant comes in. P&W would have the lead, but a partnership with RR or GE would be my guess. Currently they work with GE on the GP engine. I don’t see 3 power plants, GE is adamant they will not participate if not sole source and I don’t think Boeing can do that this time. I think they need two engines. I don’t see RR or GE catching up with P&W with its 10 billion into the GTF anytime soon. Likely that GE is contractually tied to Safran and CFM in the thrust class. P &W’s close partner is MTU and Avio is out of the mix as its owned by GE. I hope Boeing messing with Delta’s CS100s dissuades Atlanta from ordering the MAX10. I expect it to be a PAX0 in economy. Doubt if Delta will go for the MAX10, they seem to be committed to the 321. They are continuing to order A321CEO’s which looks “odd”, maybe there is an A322 brewing out there? But I don’t rule out the MAX8 for Delta? A320CEO good bang for the buck and if you don’t need more range? Delta is pretty good at getting good deals. Fuel prices look to stay fairly low, so the NEO is less advantageous . Some seem to think fuel will stay low for a considerable amount of time. Oil is one of the most volatile commodities and could ratchet up in a very short time. Airlines, enjoy it while you can, who knows what tomorrow will bring. Yes, for the sorts of stage lengths DL flies the A321 (alt-south florida, for example) I don’t see the NEO having that much value to them, they’d rather have lower capital cost CEOs. I could see DL going with the 321neoLR when the time comes to replace their etops 757s. Delta doesn’t have that many A321s yet. Those ATL-Florida routes are some of its densest markets, which is why a lot of A321s are flying there. But I doubt Delta has made a strategic decision that the A321 is a short-haul plane. I would expect Delta to run plenty of transcon flights on the A321 a few years from now — and even more if/when it gets the A321neo. Apples to apples, flying 50,000 lb of payload 1,500 nm, which burns more fuel, the MAX 10 or the A321neo? I blew up the graph and Boeing lists the 10 as 188 pax and the A321 as 188 pax. Me thinks we need an even playing field. Looking at Delta, they have 192 in their A321. So how they build the cabin is what counts. A -10 could add 12 more seats, but then an A321 could as well. According to Delta’s public fleet web page, Delta’s 737-900ER’s with 180 seats, and A321-200’s with 192 seats have the same seat pitch in all classes, and the same number of lavatories and food service areas (see links below). Based on this information, it seems to me that it would be unlikely for Delta to increase the seat count on their A321’s above 192 (domestically, they are a three class airline, not an LCC), and the the most likely seat counts for a 737 MAX 10, if Delta were to purchase any, would be 190 (one additional row each of First Class and Main Cabin) or 192 (two additional rows of Main Cabin). Here are the seat count and pitch breakdowns by class, according to the Delta Fleet Webpages. 737-900ER: 20 seats at 37 inch pitch. A321: 20 seats at 37 inch pitch. 737-900ER: 21 seats at 34 inch pitch. A321: 29 seats at 34 inch pitch. 737-900ER: 139 seats at 30 to 31 inch pitch. A321: 143 seats at 30 to 31 inch pitch. 737-900ER: 1 in First Class, 3 in Main Cabin. A321: 1 in First Class, 3 in Main Cabin. Given all the attention devoted to Trans-Atlantic flights with narrow bodies in the comments on this website, one might think that Delta ordered their A321’s with all available auxiliary tanks; however, it appears that Delta selected zero auxiliary tanks for their A321’s. See the range figures below from the Delta Fleet webpage. Could it be that Delta sees aircraft such as 737’s and A321’s as primarily short and medium haul aircraft, rather than as trans-oceanic aircraft? Is having trans-Atlantic range an advantage for whatever aircraft an airline chooses to fly from San Francisco to Los Angeles (338 miles), San Francisco to Seattle (678 miles), San Francisco to Salt Lake City (598 miles), or Atlanta to Salt Lake City (1590 miles)? Does an airline like Delta contemplating trans-oceanic service with this type of aircraft equip and maintain all aircraft of the type for ETOPS service, or just maintain an ETOPS subfleet, as Delta presently dose for 737-900ER’s and 757’s (ranges for Delta’s 757-200 sub-fleets vary from 3,393 miles for 757, and 75G, to 4,705 miles for 75S; Delta’s 737-900ER’s all have the same fuel capacity, but not all are equipped and maintained for ETOPS; as far as I know, no ETOPS yet for Delta A321’s)? How can the Max-10 have more range than the 321 NEO? Fewer passengers, lighter aircraft wins. 737 of any dash number is shorter and lighter than an A321. You can fudge fuel as well. That’s why all aspect have to be in correct relative to each other. From the Delta numbers they are packing the 737-900ER a bit tighter than the A321s. That gets into routes and averages of what works best for what and where. A321 then can go further as it has relatively fewer pax but can carry more fuel. That what makes all the PR complete nonsense at times, real world fleets and use are the best, but that varies from one airline to the next. Ergo the Model that Leeham has built that allows them to even it all up (or as best possible) and see what a true comparison is. Any idea, how much more a customer like United pays for a MAX10 vs a MAX9? I mean, how much more revenue does Boeing generate from a conversion of 100 planes vs. the cost of developing the MAX10 and the higher production cost? No clue. But more than half of United’s MAX 10 orders were converted from the abortive 737-700 order placed last year. I’m sure Boeing is getting a lot more for United’s MAX 10s than the bargain-basement prices it offered on the -700s. From a strategic perspective, the more important point is that getting United to convert to the MAX 10 makes it less likely that it will decide it really needs the A321neo. And of course, Boeing has gotten some completely new orders for the MAX 10 this week from other customers. Is the conversion to Max 10 a clever way of deferring some of United’s Max deliveries in a way that generates positive publicity for Boeing? I don’t think there are any deferrals in this announcement, but we’ll see when United releases its next 10-Q. All good and well, but 300 odd orders for Max-10 and 300 odd orders for Max-9 (taking into account UAL conversion) is still far off the nearly 1500 A321neo – yes it’s a ‘new’ aircraft and will still get more orders.. but how many? Conversions from mostly MAX9’s to MAX10 indicates that airlines are more positive about the new MAX10. In the longer term new orders will increase, especially from airlines that were previously “sitting on the fence”. 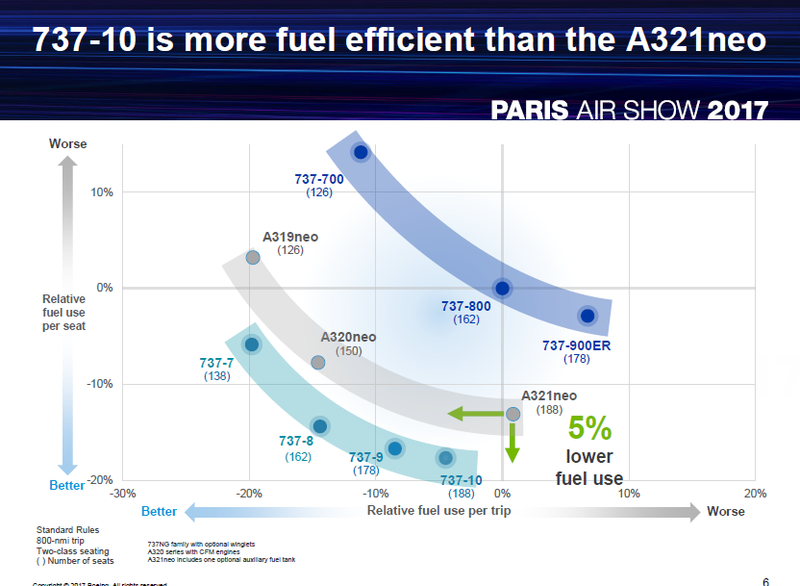 The A321 is not anymore the obvious choice and the sales ratio may change from 4:1 to maybe 2:1? End of the day a more positive outcome for Boeing than Airbus.